This large 186m2 apartment has stunning panoramic sea-views. This apartment is on the first floor and is ideally situated. It is just a 250m walk to the Umhlanga promenade and the beach. Searock is just 500m walking distance to the restaurants, supermarkets and main Umhlanga village. Other than the pool not meeting our expectations and the unit needing some TLC, we enjoyed our stay. 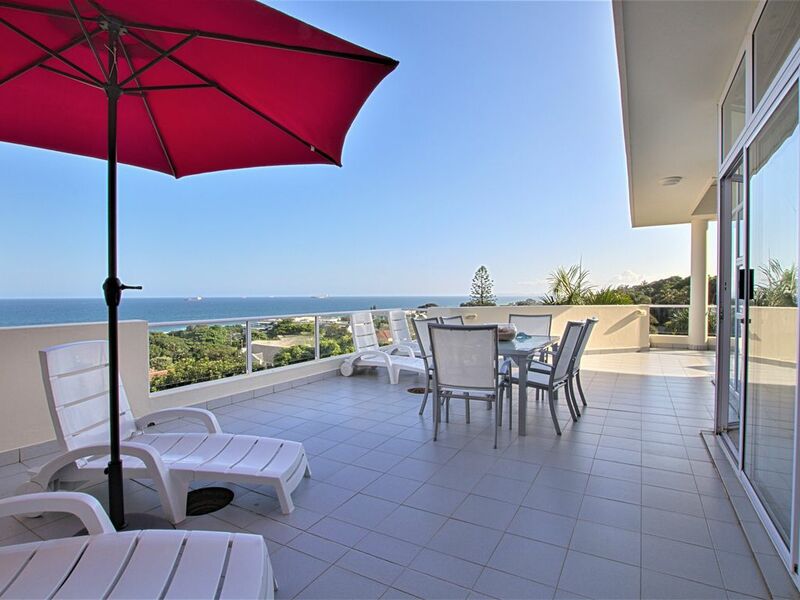 The location of this unit is fabulous (a 5 minute walk to the beach and all amenities and great views over the sea and the activities happening there), Filip is a gracious host and his assistant servicing the home does an outstanding job. The unit itself and the pool is not quite as shiny as the photos portray suggesting that they were taken some time ago. All that said, we had a wonderful time whilst there, really enjoyed our mornings on the deck, felt safe and would go back. ... und in fußläufiger Entfernung zu allen Restaurants und zur Strandpromenade. Wir hatten reichlich Platz und fühlten uns auch sehr sicher. Highlights waren sicherlich die Nespresso-Maschine und der coole Samsung-Kühlschrank. Die Betreuung durch Filip war sehr freundlich; die Maid kam alle zwei Tage und hatte alles im Griff. Insgesamt eine sehr schöne Zeit. ... and within walking distance to all restaurants and the beach promenade. We had plenty of space and felt very safe. Highlights were certainly the Nespresso machine and the cool Samsung refrigerator. The support by Filip was very friendly; The cleaning lady came every other day and had everything under control. Overall a very nice time. Je suis ravi que vous ayez passé un agréable séjour dans l'appartement et cela a dépassé vos attentes; C'est précisément notre but. Ce ne serait toutefois pas possible sans tous les hôtes adorables, nous avons le plaisir d'accueillir ici. Merci d'avoir choisi le Searock Umhlanga comme destination préférée en Afrique du Sud. J'espère vraiment avoir l'opportunité de vous accueillir à Searock Umhlanga lors d'une prochaine occasion. I am delighted that you had an enjoyable stay in the apartment and this exceeded your expectations; that is exactly our aim. It wouldn’t be possible however without all the lovely guests we have the pleasure of welcoming here. Thank you for choosing the Sea Rock Umhlanga as your preferred destination in South Africa. I very much hope to have the opportunity to welcome you back to Searock Umhlanga on a future occasion. Max six guests.to occupy this 3 bedroom apartment. Rental guests are NOT permitted to invite or grant access to further guests in the apartment complex unless the tenant obtained prior written authorization from the owner. Overcrowding of the Apartment is not permitted. Only 2 persons per one bedroom. No Parties are allowed on the property. Music and noise levels must, at all times, be unobtrusive and contained within reasonable levels so as not to create a disturbance or nuisance to fellow residents. Children above the age of 5 are welcome to stay. No Smoking inside the apartment. Under no circumstance do we allow students or bookings where all persons are under the age of 25. Consequences of non-compliance are specified including penalty, termination and eviction.